EdTech influencer, and my friend, Greg Kulowiec is credited with coining the term “App Smashing.” App Smashing occurs when one particular educational technology app does not exist to execute a needed outcome or function. The user, therefore, combines apps by stringing them together, feeding the output of one app into another in order to achieve the desired end product. 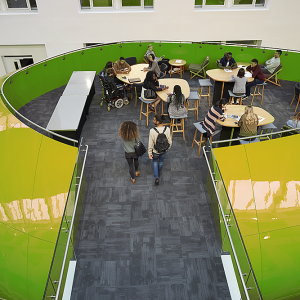 The modern iteration of Flipped Learning (FL3.0) is characterized by the OS analogy, which states that FL is an operating system within which “apps” can be used in the group/classroom space. These apps include Problem-Based Learning, Mastery Learning, and Gamification, to name a few. The modern iteration of Peer Instruction (which here I am calling PI3.0) is characterized by innovations in the approach that go beyond its beginnings, pushing this pedagogy to new heights. We are now in the age of a new kin d of pedagogical app smashing, where strategies like case-study learning and Peer Instruction are “smashed” or strung together to create something amazing, like case-based collaborative learning (CBCL), an instructional approach that leverages the best that case studies and Peer Instruction have to offer. But, the smashed app of CBCL needs an OS to run on, and that OS is FL3.0, the operating system for greater and greater innovations in active learning education. 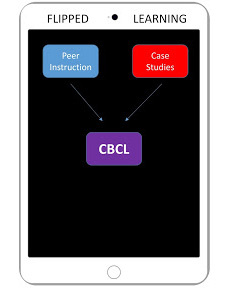 In this article, I describe Peer Instruction and its evolution to CBCL. Good education consists of many different ingredients, which include: measurable student accomplishments, flexibility in teaching, room for student practice, and strategies for student motivation.¹ While many classroom approaches can encompass some of these ingredients, very few include them all. What’s more, the gold standard in education would be a pedagogy that also makes room for students to “teach” each other. If it’s true that you never know something as well as you do when you have to explain it to someone else, then why are we not asking students to explain course material to each other as a way of achieving this robust and lasting learning in each of them? Students are given a ConcepTest — a somewhat challenging, yet superficial question on the course content. Students individually commit to an answer and share it anonymously with the class. Students then participate in small-group discussions (or think-pair-shares) and attempt to convince one another that their answer is correct. Students once again commit to an answer for the same ConcepTest question and share it with the class once more. If a sufficient number of students come to the right answer, the instructor can move on. If not, the instructor can choose to remediate by further reviewing the concept. Mazur and his colleagues have measured remarkable success in student learning outcomes using this technique.² Not only do student exam grades and overall knowledge retention improve, but peer teaching truly works. For example, on average, 40% of Mazur’s students answer ConcepTest questions correctly both the first and second time. Twenty-two percent of students answer them incorrectly both times. Only 6% of students had the questions correct first and then changed their answer to an incorrect option. But a striking 32% of students changed their first incorrect answer to the correct one after peer instruction. This approach benefits both the student receiving the instruction (who corrected an incorrect understanding) and the student giving the instruction because you never learn a concept better than when you have to explain it to someone else. The primary hurdle in adopting peer instruction is how to free up class time for these activities. ConcepTests and the peer instruction that goes with them have amazing impacts on student learning, but they take time. How can an instructor find this time in class? The answer, of course, is by using Flipped Learning (FL). By assigning students videos to watch before class, instructors can ensure that students arrive to class with background knowledge already in hand (or head, actually). This not only frees up class time for ConcepTests but also gives students the knowledge they need in order to successfully approach those activities. Interestingly, just as Flipped Learning has evolved from a 1.0 framework to its current 3.0 level ³, so too has peer instruction. In its infancy, at the 1.0 level, FL was “all about the videos,” with little attention or consensus given to the use of the group space time. Peer instruction 1.0 was all about the ConcepTests. To be clear, videos are an important part of FL just as ConcepTests are critical to the success of PI, but there is more to both strategies as well. 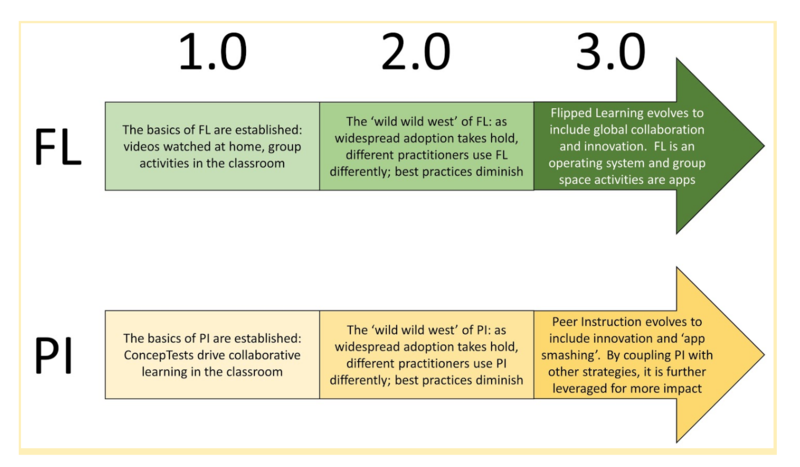 FL2.0 was a “wild, wild west” of siloed approaches, and the same can be said of PI. While some derivations of PI are worthwhile, such as using the Plickers app and associated technology to quickly and comprehensively scan an entire classroom for committed student answers 4, others forms of PI diminished the approach to something gimmicky. And, just as Flipped Learning is blossoming into its 3.0 era of new innovations and effective implementations, the same is becoming true for PI. To Mazur’s credit, his approach to peer instruction continues to evolve. ConcepTest questions continue to be tweaked, textbook choices are altered, and assessments of student understanding are matched to the peer instruction pedagogy. However, some of the most exciting innovations around PI are coming not from Harvard University in Cambridge, MA, but from just across the Charles River in Boston at Harvard Medical School (HMS). At HMS, Dr. Richard Schwartzstein has pioneered CBCL.5 In this approach, medical students are provided with a hypothetical patient case and asked to make a differential diagnosis based on the evidence given in the case. Students first commit to an answer by writing it on an index card and they then discuss their ideas with the small group of classmates sitting at their table. After some discussion, the instructor prompts the students for their thoughts and those students who participate must back their ideas with knowledge and evidence. Then, the instructor shares more information from the case, and the students once again break into small discussion groups. This process continues until eventually the entire class correctly diagnoses the patient in the case study and recommends the appropriate treatment. I was privileged enough to personally observe Dr. Schwartzstein using CBCL at HMS, along with Jon Bergmann and FLGI International Faculty member Barry Sponder. It was amazing to see the degree to which students were engaged, challenged, thinking critically, and learning. Nothing stays great forever. The cycle of innovation ends in one of two ways: improvement (which leads to another cycle) or obsolescence (which ends the innovation). FL and PI have both taken the path of the former, being improved and evolved over time. While the nature of that evolution differs between the two, the spirit of improvement is shared between them. The only questions that remain, then, are what FL4.0 and PI4.0 will look like, and how deeply they will be linked to one another. Only time, and further evolution, will tell. We see evidence that practitioners on the leading edge of Flipped Learning are thriving by following the evolution of instructional models and combining teaching strategies in new and exciting ways. In the process, they are unlocking a new wave of possibilities for learning and defining next practices. 1 Kaur, T. (2017). A Survey on Impact of Interactive Teaching on Teaching-Learning Process. 2 Crouch, C. H., & Mazur, E. (2001). Peer instruction: Ten years of experience and results. American journal of physics, 69(9), 970-977. Thomas, these are great flipped strategies. I recently used PI at the end of a nursing course: a complex question combined with a case scenario that would tie in learning from the previous units. PI with the case scenario was a much more effective way to eventually come to the correct decision than traditional way. I can see how this would align well to improve critical thinking, clinical judgement, and clinical reasoning in nursing education.